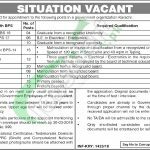 Tap this page for PO Box 999 Jobs 2018 Karachi Government Organization Latest. Applications are invited for the latest vacancies announced in a Government Organization Karachi for which Male & Female individuals who are well educated, skilled and experienced are welcome to apply for (Assistant Secretary, Assistant Engineer, Assistant, Jr. Scale Stenographer, Sub-Engineer, Junior Clerk, Record Clerk, Caretaker, Naib Qasid, Farash). Initially, these positions will be recruited on contract basis which can be permanent on satisfactory performance of an individual. Candidates possessing valid Domicile of Sindh and relevant qualification/experience as per the eligibility criteria are welcome to apply and detailed criteria can be examined from the following image posted below, according to which for these positions Graduation/Intermediate/DAE/Matric/Middle pass candidates having relevant experience are welcome to apply. Detailed how to apply procedure given below after this paragraph. Candidates meeting criteria are suggested to submit their applications written on plain paper along with attested copies of educational certificate, experience certificate, CNIC, domicile and recent photograph on the following address given below. The last date for submission of application is March 30, 2018. Last Date to Apply: March 30, 2018. Address: PO Box No. 999.